Dr. Bhise, the author of this book is a mechanical engineer by profession and has held several management and research positions in Ford Motor Company at Dearborn, Michigan, U.S.A. and is a visiting professor at the University of Michigan. 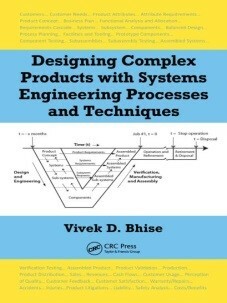 Thus the author combines the best of academic and industry environment experience to qualify as an author of such an excellent book which uses system engineering approach to design products and systems with several interacting components to meet the user’s requirements and expectations. Starting with basic definitions of a product, system, subsystem and components, customer’s needs etc., the author develops the subject into higher levels of design and processes to achieve the design with specified level of attributes and design objectives.. The book also discusses how to manage the processes involved in the lifecycle of products, from the stage of conceptual design to disposal stage, with the objectives of increasing customer satisfaction, quality, safety, and usability and meeting program timings and budgets. While the Part I of the book covers basic systems engineering concepts, and issues, employed in a product design, Part II deals with issues related to quality, human factors, and safety engineering approaches used during manufacturing phase. Part III of the book describes important tools and methods employed in each of these areas. Part IV includes applications of useful techniques, and observations from some product development case studies. The book will be found very useful by post graduate and under graduate students. Process engineers, system engineers, safety engineers, chemical engineers, mechanical engineers and managers in the process industries will also gain from the in depth information contained in the book.